Add64 is a realtime additive/subtractive-synthesis softsynth for linux, developed by Matthias Nagorni. 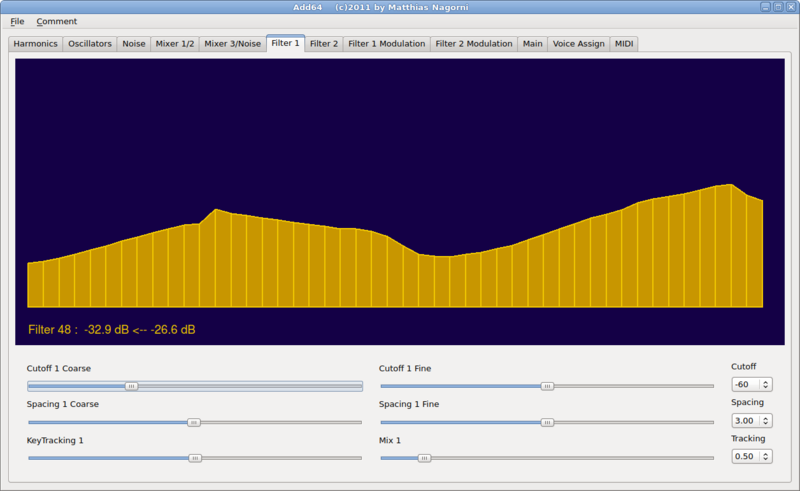 It is available in the repositories of many linux distros, including Olivier Humbert's Librazik-2, a lightweight audio-production-based distro. 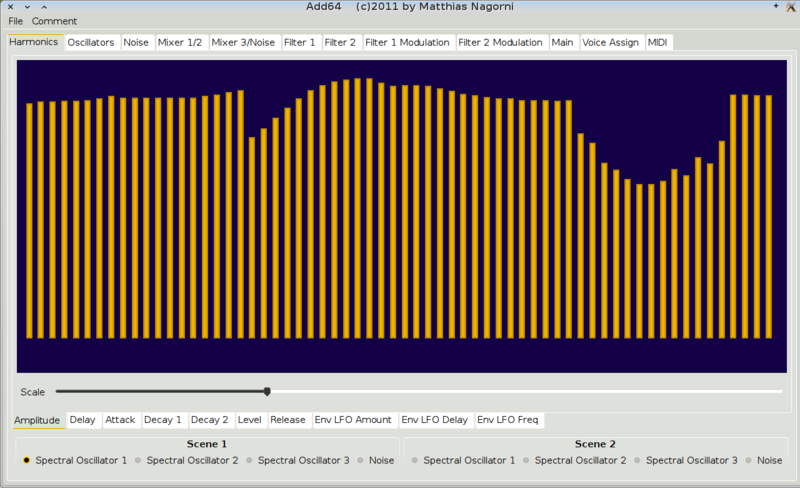 The screenshots above show the harmonics window for Spectral Oscillator 1 and the window page of Filter 1. If opening Add64 from a terminal, type Add64. Add64's user interface departs from the traditional knobs-and-buttons approach by using spectral graphs to 'design' the oscillators, and by morphing these spectrums over time in unique ways, thereby allowing to obtain timbres that are difficult if not impossible to obtain with many other types of synthesizers. Add64 has two "scenes." Each scene has three oscillators and a noise source. Each of the vertical yellow lines in a given spectrum indicates the amplitude of a harmonic frequency. Each oscillator has its own attack, delay, decay 1, decay 2 and release levels, as well as controls for the amount, delay and frequency of the LFO signal. Add64 allows to morph between these two scenes, at adjustable frequencies. Add64 also includes 2 mouse-drawable filters, with the possibility of morphing between these as well. The filters can be arranged in parallel or in series, or a mixture of both arrangements. There are also controls provided for adjusting the noise bandwidth, for dramatic changes in noise range and timbre. A helpful manual is included in the tarball at Sourceforge (see link below). Add64 also allows for midi cc binding. Effects include panning, antialiasing adjustment and signal compression. To get started making sounds with Add64, either load a preset, or adjust the following: in the Main tab, set Scene Morphing to Scene 1; in the Filter 1/2 tab, turn down the Filter 1/2 mix to 0; in the Mix 1/2 tab, adjust the Spectral Oscillator Filter 1/2 Morph 1 to center; adjust the Serial/Parallel 1 slider to Serial; in the Harmonics tab, select Spectral Oscillator 1 and increase the first harmonic bar for Amplitude, Decay 1 and 2, Level and Release. NB: Add64 requires a lot of CPU processing. In order to avoid audio glitches and dropouts, consider using an OS that is dedicated to live audio production, with performance adjustments as needed. For recording Add64's audio signals, I find Rezound to be a very lightweight recording application that doesn't interfere with the audio signal processing. This application is also available in many linux distros. Add64 presets and be created, saved and loaded in two different formats: simple text and XML. My rolling preset collection (includes all presets made up to now) can be downloaded in XML format here: 89 Add64 Patches (XML format) or in simple text format here: 89 Add64 Patches (text format). --Updated Feb. 27, 2018. A manual is included in the tarball at Sourceforge (see link below).